True Manufacturing Swing Door Freezer Merchandiser 5 cu. ft.
Countertop Freezer Merchandiser, one-section, -10° F, (2) shelves, laminated vinyl exterior, white interior with stainless steel floor, (1) triple-pane thermal glass hinged doors, backguards, LED interior lights, leg levelers, 1/3 HP, 115v/60/1, 9' cord, NEMA 5-15P, 6.0 amps, MADE IN USA. 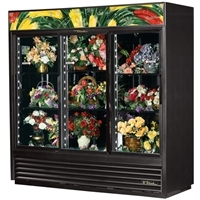 True Manufacturing Radius Front Glass Door Floral Merchandiser 72 cu. ft.
Floral Merchandiser, three-section, (6) shelves, black exterior & interior with stainless steel floor, (3) Low-E thermal glass hinged doors, LED interior lighting, 3/4 HP, 115v/60/1, 6.5 amps, NEMA 5-15P, 9' cord, ENERGY STAR®, MADE IN USA. 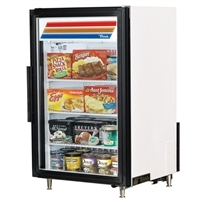 True Manufacturing Swing Door Freezer Merchandiser 7 cu. ft.
Countertop Freezer Merchandiser, (3) shelves, -10° F, laminated vinyl exterior, white interior with stainless steel floor, (1) triple-pane thermal glass hinged door, LED interior lights, 2-1/2" legs, 1/3 HP, 115v/60/1, 6.7 amps, 9' cord, NEMA 5-15P, MADE IN USA. True Manufacturing Swing Door Freezer Merchandiser 10 cu. ft.
Freezer Merchandiser, one-section, -10° F, (3) shelves, black vinyl exterior, white interior with stainless steel floor, (1) triple-pane thermal glass hinged door, fluorescent interior lights, 1/3 HP, 115v/60/1, 7.4 amps, 9' cord, NEMA 5-15P (depth does not include 1" for rear bumpers), cUL, NSF, MADE IN USA. True Manufacturing Swing Door Freezer Merchandiser 12 cu. ft.
Freezer Merchandiser, one-section, -10° F, (3) shelves, black vinyl exterior, white interior with stainless steel floor, (1) triple-pane thermal glass hinged door, LED interior lights, 1/3 HP, 115v/60/1, 7.4 amps, cord, NEMA 5-15P, (depth does not include 1" for rear bumpers), cUL, CE, NSF, MADE IN USA.